The introduction by the Kosovo administration of the custom taxes for goods from BiH and Serbia jeopardizes, not only trade, but also the stability of the region, since such unreasonable political moves of Priština authorities lead to disintegration processes and regression in relationships, emphasized the Minister of Foreign Trade and Economic Relations of BiH, Mirko Šarović at the meeting with ministers responsible for agriculture and trade of countries of Southeast Europe. 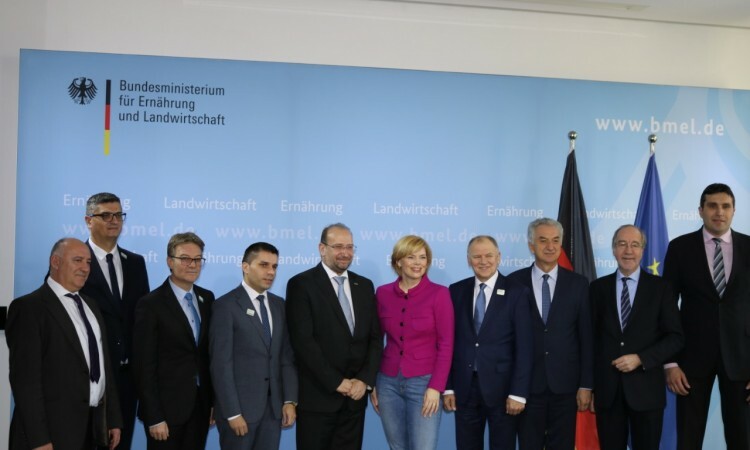 The meeting was held on Monday in Berlin where Šarović also met with German Agriculture and Food Minister, Julia Klöckner, and European Commissioner for European Affairs, Vytenis Andriukaitis. It was emphasized that the unilaterally imposed barriers to trade between the CEFTA countries must be abolished immediately, in order to avoid problems on already achieved progress, integration and development of the Southeast Europe region. Minister Šarović pointed out that free and fair trade is fundamental for the region, and that this matter is far more than an economic issue for all countries of the Western Balkans. “Removal of the barriers in trade, promoting cooperation and strengthening ties between the countries of the Western Balkans is promoting and accelerating the economic growth and development of the society as a whole, and this process has no alternative”, Šarović said. There are indications that the authorities in Priština are already considering the possibility to abolish the taxes, in accordance with requests from various parties. European Commission and German officials agree that the solution to overcome such disintegration processes will not be possible without the strong and concrete involvement of the European Commission, including The Federal Republic of Germany as one of the most important members of the European Union. Šarović informed the interlocutors that, despite unilaterally introduced trade barriers, Bosnia and Herzegovina maintained constant communication with the authorities in Priština and announced the meeting and bilateral talks between the two sides in order to abolish the measures introduced. Taxes of 100% for goods from Serbia and BiH were imposed at the end of November 2018. Since then, BiH enterprises have lost more than USD 4,5 million. BiH authorities decided not to take countermeasures but to try and negotiate with the Kosovo side on this problem. In the first 11 months of 2018, BiH exported total of BAM 14 mln worth of goods (about EUR 70 mln) to Kosovo. In the same period, imports from Kosovo to BiH had a total value of BAM 15.7 mln (about EUR 31.3 mln).